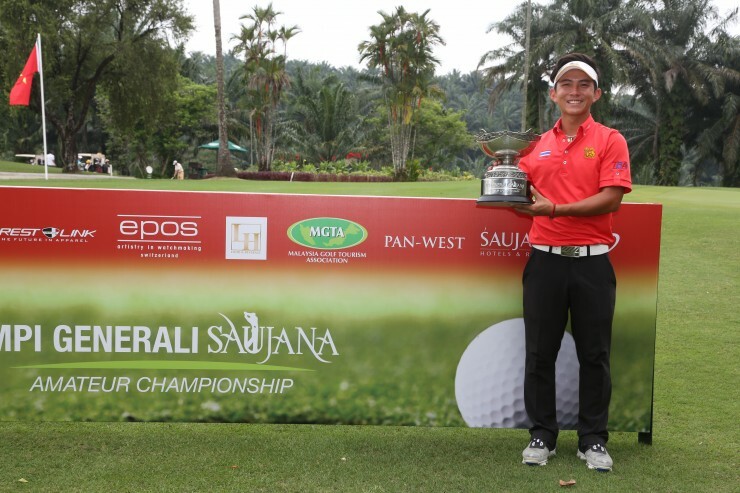 “Oh no ­– not again!” That was Thailand’s Witchayanon Chothirunrungruen reaction when Taiwan’s Wei-Hsuan Wang nailed his 25-footer birdie putt to force a playoff at the final 18th hole in the MPI Generali Saujana Amateur Championship. Almost a week earlier Witchayanon had lost in the playoff with Australia’s Lachlan Barker for the Malaysian Amateur Open title. Going into the 3rd and final day of play, Wang had a 2-stroke advantage over Witchayanon and Australia’s Josh Armstrong. At the turn, Armstrong was already out of the running after posting a double bogey at the Par 5, 7th and a bogey at the Par 4, 9th. At the turn, Witchayanon was level with Wang with birdies at Holes 10 and 11. A birdie at the 14th gave a 1-stroke lead back to Wang but Witchayanon again produced back-to-back birdies at Holes 15 and 16 to turn the tables on Wang. At the final hole, Witchayanon parred and Wang successfully made the birdie to force a playoff. In the sudden death, Witchayanon found the greenside bunker with his second shot. Wang went for the hole cut at the right corner which is fringed by water right and back. The ball hit the green and kicked right into the pond. Witchayanon blasted out to about 5 feet from the pin. Wang took a lateral water drop about 15 feet away but failed to put the ball into the hole and Witchayanon sank his par putt to claim victory. Wang carded a final day 69 to score 207 with Witchayanon. His compatriot Ting-Wei Hsieh produced 7 birdies and 2 bogeys to return with 67 to claim the 3rd spot. Danial Durisic was the best Malaysian at 217.